Jayson Speters (Casey) and Cameron Folmar (Tracy) in the Guthrie Theater’s production of The Legend of Georgia McBride. Photo by Dan Norman. When playwright Matthew Lopez was a teenager, drag queens in a gay bar in the Florida Panhandle helped him come out about his sexuality. His play The Legend of Georgia McBride pays homage to the supportive drag queens of his youth by creating a story of a straight man that find both a livelihood and career satisfaction as a drag queen. 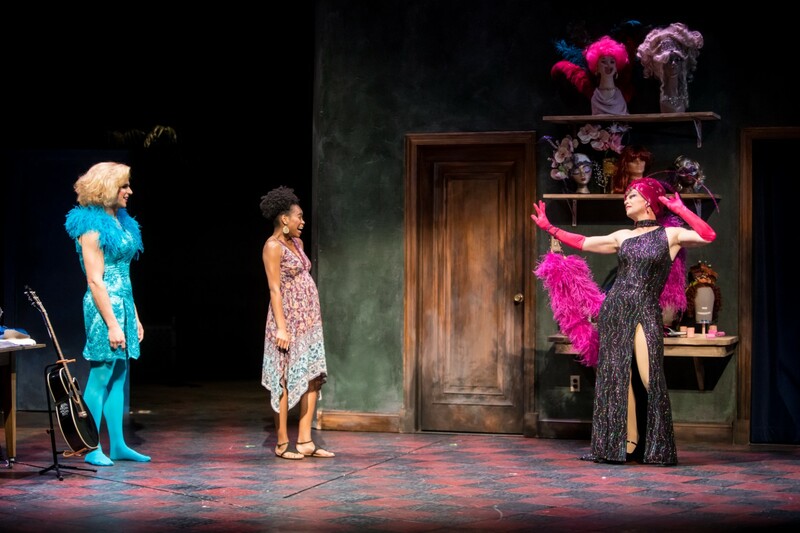 McBride, directed by Jeffrey Meanza, opened this past weekend at the Guthrie Theater. The production has an infectious enthusiasm for sharing the colorful world of drag. The show’s protagonist is Casey (Jayson Speters), a young man who is married to Jo (Chaz Hodges). Soon, he learns that they have a baby on the way. Despite the fact that Casey is in dire financial straits, he maintains a cheery optimism that wins over his wife – even when she is upset about his bouncing the rent check. Casey’s dwindling career as a lip-syncing Elvis impersonator comes to an abrupt end when Eddie (Jim Lichtscheidl), the owner of the small rural bar he performs at, decides to take the bar’s entertainment in a new direction. Eddie’s talented but struggling cousin Tracy (Cameron Folmar) and his friend Rexy (Auturo Soria, who also play’s Casey’s neighbor Jason) arrive to showcase a drag queen show. Arturo Soria as Rexy in The Legend of Georgia McBride. Photo by Dan Norman. Casey is devastated to lose his Elvis gig. Tracy, who we learn has a heart of gold, feels bad about displacing Casey and insists that Eddie let him stay on as a bartender. One night when Rexy is passed out, a desperate Eddie and Tracy press Casey to take his place. Although Casey is initially reluctant to be a drag queen, Tracy sees his potential and mentors him in the fine points of drag – namely attitude. Casey’s Elvis impersonator experience in sequins, makeup and lip-syncing provide a natural progression to drag costumes and performing. Soon, he finds himself to be both a star and financially stable – but he is not comfortable about being a drag queen and keeps his new profession a secret from his wife and friend. The fallout from this secret leads to the play’s crisis and resolution. Despite some heavy themes about self-identity, the charm of this show lies in its campy entertainment. From biting barbs by the drag queens to the entertaining lip-syncing musical dance numbers, the show provides its audience with a fun romp. The hilarious cultural references keep the audience laughing, especially a Sound of Music joke that I won’t give away here. Speters plays the role of Casey with a boyish enthusiasm making believable his acceptance of Tracy’s matronly tutelage of Tracy. Folmar, as Tracy, creates an ebullient character that is warm and loving to all, but succeeds in showing a jaded side when Casey disappoints him. Sorie as Rexy provides the most dramatic moment of the play when she lashes out at Casey about the harassment and physical abuse he has suffered as a drag queen. All three characters provide entertaining musical interludes; Folmar’s “Liza with a Z” number is a standout. Lichtscheidl’s Eddie succeeds in his brief scenes to transform Eddie from a sour drunk to a caring, productive business manager. Hodges as Jo has only a few scenes, but she does manage to get off some great zingers to counter Casey’s eternal optimism. Jayson Speters (Casey), Chaz Hodges (Jo) and Cameron Folmar (Tracy) in The Legend of Georgia McBride. Photo by Dan Norman. Mathew Steffens chorography upgrades the lip-syncing numbers with sharp dance moves. His design of Rexy’s brassy dance number is breathtaking. Mikko Suzuki MacAdams scene design creates a wonderful seedy bar with little touches that slowly upgrades the stage to a quality performance hall. Patrick Holt’s drag queen costumes dazzle the audience especially with the delightful over abundance of sequins images at the end. McBride provides a touching insight to the people who become drag queens and why they perform. With its zestful and entertaining performances it also gives its audience with a rip-roaring good time. The Legend of Georgia McBride runs through August 26 at the Guthrie Theater’s McGuire Proscenium Stage.